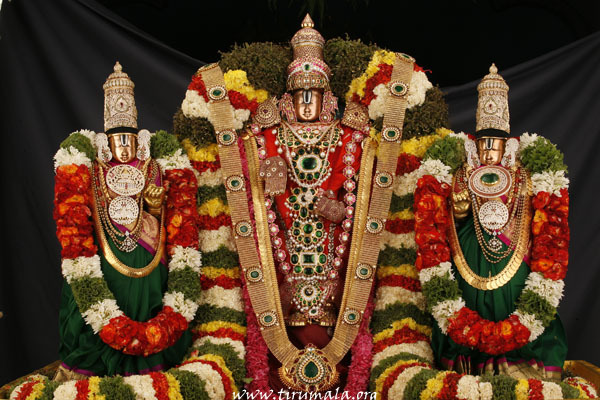 Tirumala Tirupati Devasthanam TTD performs the festival of Sri Padmavathi Parinayam for three days at Narayanagiri,Tirumala in every year. This is an annual seva conducting every year on the days of Navami,Dasami and Ekadasi in the month of Vaisaka(May/June). Narayana Gardens decorates with colourful flowers, sparking lighting, flower banners, lord idols with flowers. Sri Padmavathi Parinayam Festival means three day long grand wedding ceremony of Lord Malayappa Swamy and Goddess Padmavathi Ammavaru.For this celestial wedding colourful kalyana madapam arranges at Narayanagiri Udyanavanam,Tirumala. Every day, evening Sri Malayappa Swami, the festival deity of Lord Venkateswara arrives in grand style on Gaja Vahanam (First Day-Navami) ,Aswa Vahanam (Second Day-Dasami) and Garuda Vahanam(Third Day-Ekadasi) from Main temple to specially decorated Kalyana Madapam at Naranagiri while Goddess Sridevi and Bhudevi arrive on separate palanquins. Wedding takes place according to Hindu dharma and performs some traditions like EDURUKOLU,New Clothes offerings.Every Day (during these three days) after the wedding in Kalyana Madapam, "KOLUVU" is held and number cultural programs like Harikatha,Bhajana,Dance,Music,Veda Parayanam and etc., take place. Firing of Colourful Crackers also take place to enlighten the wedding celebrations. After Wedding ceremony Lord Malayappa Swami and Goddess Bhudevi and Sridevi return to the main temple and thus Sri Padmavathi Parinayam closes on the third day in a colourful way. On the first day Lord Sri Malayappa Swami arrives on Gaja Vahanam to newly decorated Kalayana Madapam and Goddess Sridevi and Bhudevi on separate Palanquines.As a part of Wedding ceremony on the first day, EDURUKOLU,Exchange of Flower Bouquet (PulaDandalu),Game of Flower Ball(PulaBhanti Aata),New clothes offering programs are traditionally conducted. After completion of wedding ceremony Lord Malayappa swami along with Sridevi and Bhudevi as procession return to main temple. On the second day Lord Sri Malayappa Swami arrives on Aswa Vahanam and followed by Goddess Sridevi and Bhudevi arrive on DHANTHAPU pallaki to newly constructed and specially decorated Kalyana Madapam at Narayanagiri. As a part of wedding celebrations Edurukolu,New clothes offering,Pulabanti Aata,Exchange of flower bouquet are traditionally conducted by Veda Pandits. Veda Parayanam,Music and Harikatha take place during the wedding celebrations. On the final day of Sri Padmavathi Parinayam, Lord Sri Malayappa Swami arrives on Garuda Vahanam(Garuda vahanam is the most dearest vahanam among all vahanams to Lord Venkateswara) and Goddess Sidevi and Bhudevi arrive on Dhanthapu Pallaki to specially decorated kalyana mandapam at Narayanagiri, tirumala. As a part wedding celebrations Edurukolu,New clothes offering, Pulabanti Aata, Exchange of flower bouquet are traditionally conducted by Veda Pandits. Veda Parayanam,Music,Dance and Harikatha take place.Colourful crackers also fires to enlighten the wedding celebrations.